This 4 colors 4 stations Silk Screen Printing Machine is the best DIY t-shirt printing machine for making the versatile screen printing designs in almost everything. The 4 color 4 stations screen printing kit is very powerful in making versatile in screen printing design. The textile/garment screen printing industry owner’s best choice is the 4 color 4 station screen printing machine. They like it for T-shirts, garments, bags, PVC and sports clothes and so on. 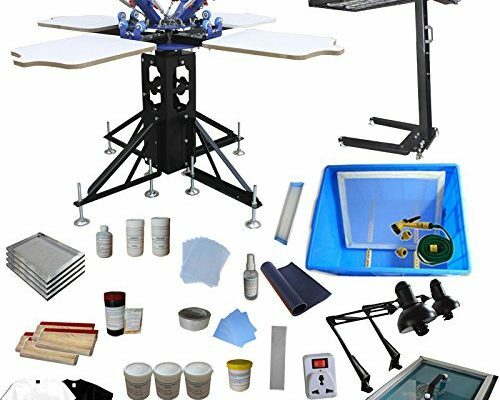 This silk-screen printing press is particularly designed for individual printing shop, t-shirt shop, and small business workshops etc. This t-shirt screen printing DIY can be operated by one or two people. The screen printers can work on one platen station. The frame and platen station can rotate in 360 degrees. So, they can operate without moving. T-shirt printing is perfect for this press but clothes and other products also can be printed on it. There is a flash dryer with this silk screen printing machine as optional. The flash cure dries the upside platen and the surface of objects after printing. To improve work efficiency, then the users can print the next color. Almost every substrate can be used. This 4 color 4 station screen printing press is the package with all requirements by screen printing workshop. 1 set of UV Exposure Unit Kit: plug, timer, glass & sucker, rubber sub-plate included.